Glenn Greenwald, the reporter who first published Edward Snowden's NSA documents, will be leaving the Guardian to start his own news venture, Buzzfeed reports. The news organization will be "a very well-funded… very substantial new media outlet," Greenwald told Buzzfeed. He could provide only a few details because news was leaked before he was prepared to announce it, but Greenwald said that he will have more details soon. After the bipartisan co-chairs of the House Disabilities Caucus condemned a sign that read "Thank You Tea-Tards" at an Organizing for Action shutdown rally in front of the Capitol Tuesday, OFA also condemned the display, according to Buzzfeed. Condemnations came after reporters tweeted photos of the sign. Tortilla Coast, a Tex-Mex restaurant on Capitol Hill, took advantage of its new fame on Tuesday, after it was revealed that a few House Republicans met with Sen. Ted Cruz (R-TX) in the restaurant's basement. Republican members of the House sang 'Amazing Grace' at a caucus meeting Tuesday morning, according to the Huffington Post. Rep. Steve Southerland (R-FL) led the members in the hymn instead of the usual opening prayer. Rep. Michael Burgess (R-TX) told the Huffington Post that it was "impressive" that the members could sing three verses of the song from memory. Rep. Charlie Rangel (D-NY) on Tuesday compared the small faction of Tea Party Republicans in the House to Civil War Confederates while discussing the government shutdown. "This is all about a handful of people who got elected as Republicans that want to bring down our government. You can see it in the streets. You can see where they're coming from," Rangel said on CNN. "And the same way they fought as Confederates, they want to bring down the government and reform it." Former Defense Secretary Leon Panetta on Monday blamed the current fiscal crisis on both the White House and Republican leaders, lamenting the lack of trust between the two parties. Panetta said that President should not walk away from negotiations. 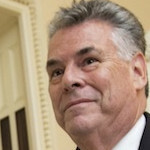 Rep. Peter King (R-NY) said Friday that Sen. Ted Cruz (R-TX) has done so much to unintentionally boost Obamacare's popularity with his crusade to defund it that President Obama should thank Cruz with a campaign donation. Erick Erickson, prominent conservative blogger, said on his blog Friday that he will be donating to the primary opponents of House Speaker John Boehner (R-OH) and Senate Minority Leader Mitch McConnell (R-KY) because of the way both leaders are approaching negotiations on the continuing resolution and debt ceiling. Virginia Attorney General Ken Cuccinelli (R) released a new campaign ad Friday, calling his Democratic opponent in the governor's race, Terry McAuliffe, "despicable" and hitting him for investing with a man who has been charged with defrauding insurers. A meeting between Republican senators, President Barack Obama and Vice President Joe Biden finished around 1 p.m., according to the White House Press office.